We have been discussing on Council the very complex ethical and legal issues around posting photos (on Twitter and on this web site) of monuments and other memorials. These could be politely described as a minefield. The issues around reuse of monuments are even more complex and intractable. Lutyens’ unfortunate choice of stone for the Commonwealth War Graves memorials means they have to be renewed regularly. The old memorials cannot be reused and are broken up for use as chippings. And what should we do with memorials to those whose activities are now considered to be reprehensible – slave traders, racists, men who in their own day were revered as war leaders and are now considered war criminals? Members will remember the debates over Jimmy Savile’s tombstone when the full horror of his activities became apparent. Llanblethian has an even more striking example of reuse, striking because it seems to have been done so soon after the stone was first installed At the base of the tower, fixed against the north wall, is a floriated cross slab commemorating Eme… the wife of Walter Torig. The full inscription reads DAME : EME..T : LA : FEMME : WATER : TORIG : GIST : ICI : D[EU : [D]EL : AME : EIT : MERCI . 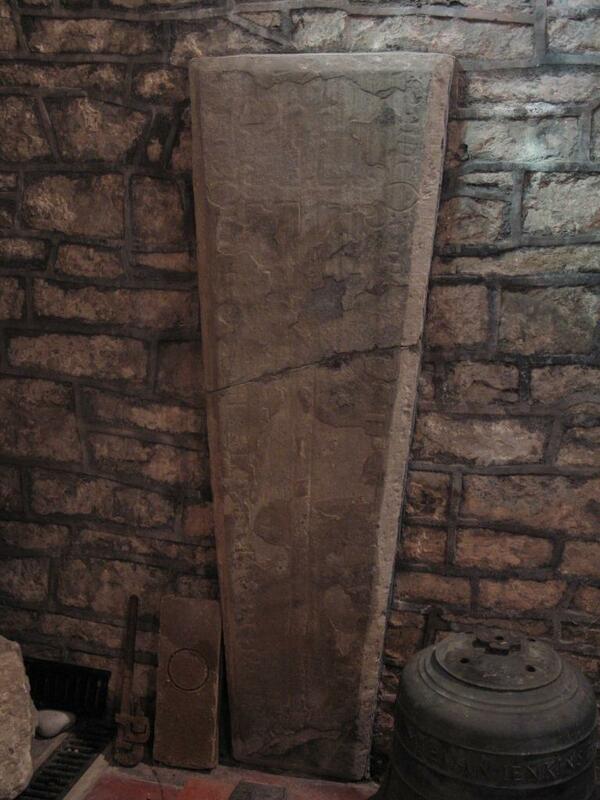 (There may have been a further inscription on the chamfer but it is now indecipherable.) Nothing is known about Eme… or about her husband. The stone is a tapering slab with a single chamfer. 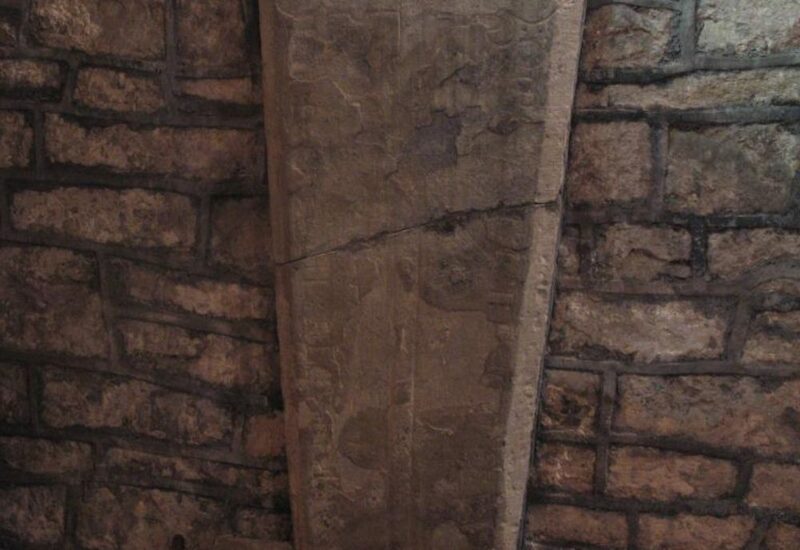 This would suggest an early date in most parts of England, but in Wales tapering slabs were still being used in the sixteenth and seventeenth centuries. The design of the cross, with its knopped arms and large plain fleur-de-lys finials, looks early fourteenth century, and this would also fit with the large Lombardic capitals of the inscription. 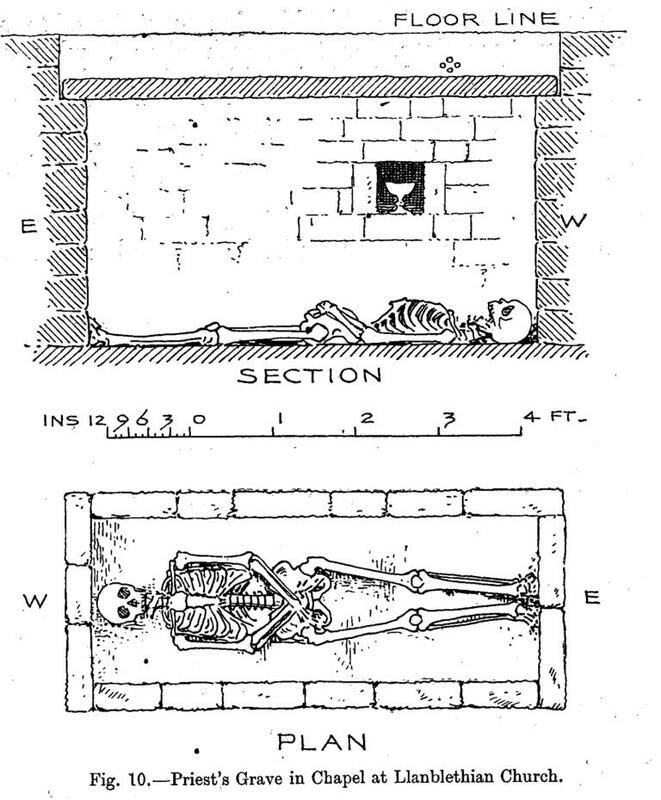 The stone was actually found inverted (carved side down) in the south chapel, over a stone-lined shaft containing a skeleton. In a niche in the side of the shaft was a low-grade pewter chalice. 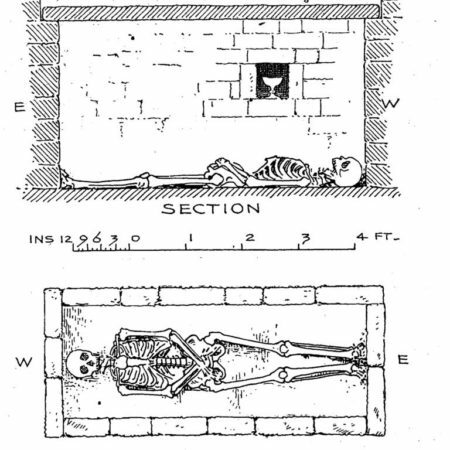 Priests were normally buried with replica chalices, so we can assume that the skeleton is that of a priest and not a woman. 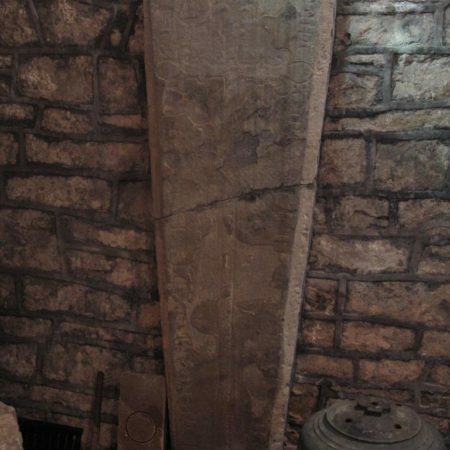 The chalice can still be seen, and from its style it is probably fourteenth century – so the tomb slab may have been used to cover the priest’s grave within the lifetime of someone who saw it laid in its original location over Eme…’s grave.